steady breeze and great racing provided the perfect recipe for the opening day of competitive action at the 2014 ISAF Youth Sailing World Championship in Tavira, Portugal. After a slightly calm morning the breeze kicked in mid-afternoon allowing a full complement of races across the eight events. The 367 sailors from 67 nations were spoilt by the Portuguese conditions with a breeze that varied between 12-15 knots coming in consistently from a south westerly direction. Laser Radial Boys racer Seafra Guilfoyle (IRL) was all smiles post racing and had reason to be, he holds the lead in the 57-boat fleet. Like Hughes in the girls division, Guilfoyle revelled in the breeze and took the first bullet. A fifth place followed and he leads on six points, tied with Denmark’s Patrick Dopping. In the 29er Class Sean Donnelly and Patrick Crosbie have had three races and are lying 20th in the 30 boat fleet. 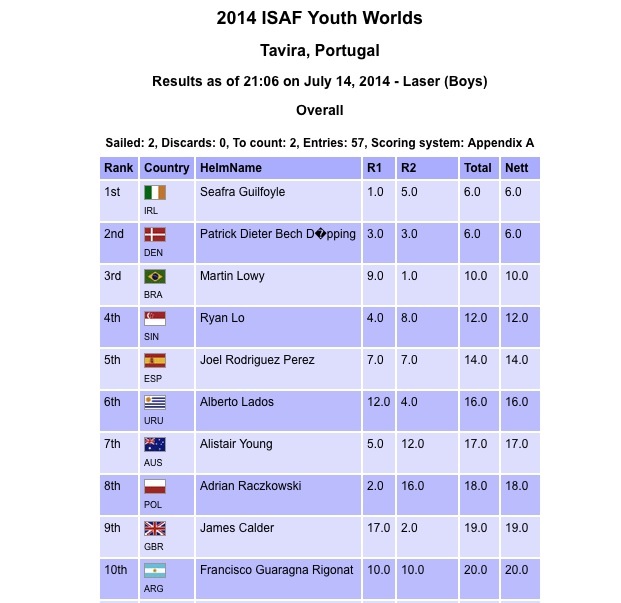 Brazil’s Martin Lowy completes the Laser Radial Boys podium after the opening racing yesterday.